Call of Duty fans know they're getting plenty of bang for their buck, says Treyarch's community manager. Treyarch's Josh Olin says that gamers have gotten used to the comparatively high price of Call of Duty DLC. This comes ahead of the release of the Escalation, the second map pack for Call of Duty: Black Ops, which - like its predecessor, First Strike - to have a price tag of around $15. Olin said that, on the whole, people didn't mind paying a little bit more than they might for DLC for other games, because they realized they were getting good value for money. Olin said that the content in Escalation - which contains four multiplayer maps for the main game and one new zombie map - were all completely new, and added new gameplay mechanics and features like ziplines and destructible bridges. 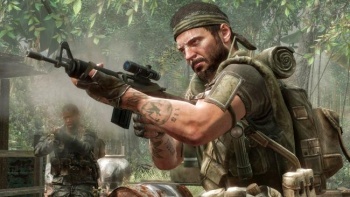 Treyarch felt it was important that the DLC was more than just simple maps, Olin said, adding that fan feedback had helped guide the studio into decided what to include. "All through the year we've been talking about 'ratcheting the bar up,'" he said. "So for DLC we've got to figure out how to ratchet up the levels themselves. One thing a lot of fans loved about Black Ops multiplayer was the interactivity on our multiplayer maps ... They said they wanted more, so that's why you see things like the ziplines and the bridge in Discovery." Complaints about DLC pricing aren't anything new, and while they are getting to be less common, they're not ever going to go away completely. Such complaints are often from just a vocal minority however, and rarely represent the general mood towards the content. Speaking at PAX East in 2010, Microsoft's Larry Hyrb, better known as Major Nelson, said that incorrectly priced DLC simply didn't sell, and it's worth noting that despite the fairly high price, Call of Duty DLC sells incredibly well. When the Stimulus pack for MW2 arrived on PSN in Europe last year, for example, the floods of people trying to get the content actually caused a number of problems with the service. The Escalation Map Pack comes out on Xbox Live on May 3rd.